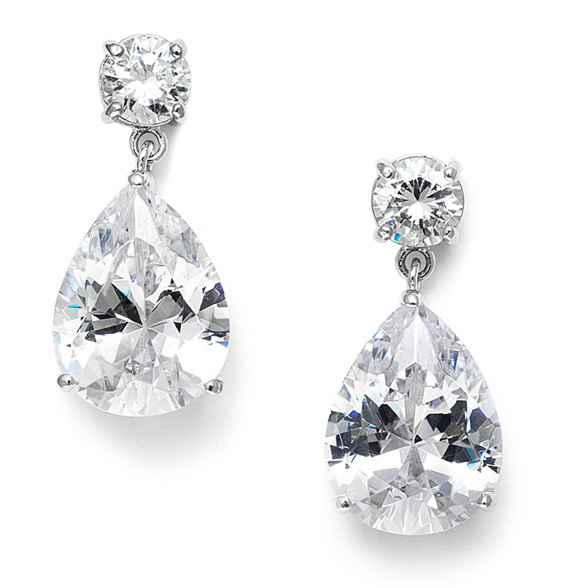 * Our Cubic Zirconia Pearshape Drop Bridesmaid or Wedding Earrings are 1" h and 1/2" w.
* The lustrous CZ top and bold teardrop are plated in silver rhodium making it a stunning wholesale accessory for weddings, bridesmaids, mothers of the bride or proms. * The sheer simplicity of this wholesale wedding earring defines its beauty. * The brilliance of its high quality Cubic Zirconia makes it a stunning & classic accessory for your wedding, bridesmaids, mothers of the bride or prom. * Available at an attractive wholesale price, put this teardrop earring in your store display and watch it reorder over and over!